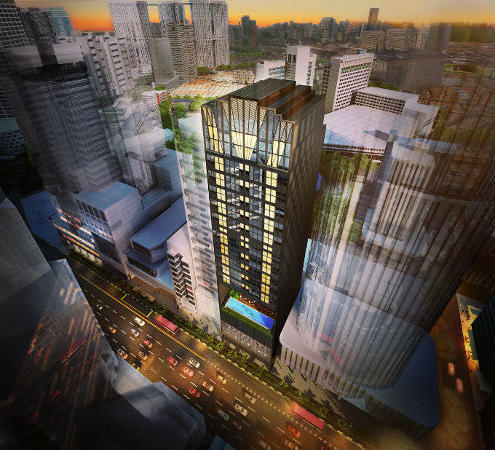 Crown @ Robinson, Singapore commercial property with strata-tiled offices and shops. Address: at 140 Robinson Road. District: 01, Central Business District (CBD). Tenure: Freehold. 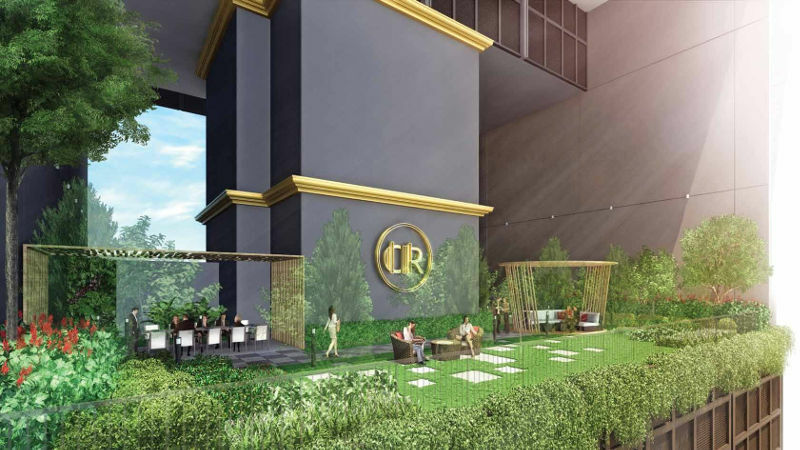 Crown at Robinson is a rare freehold strata-titled commercial property development set right at the heart of Singapore Central Business District (CBD) at 140 Robinson Road. 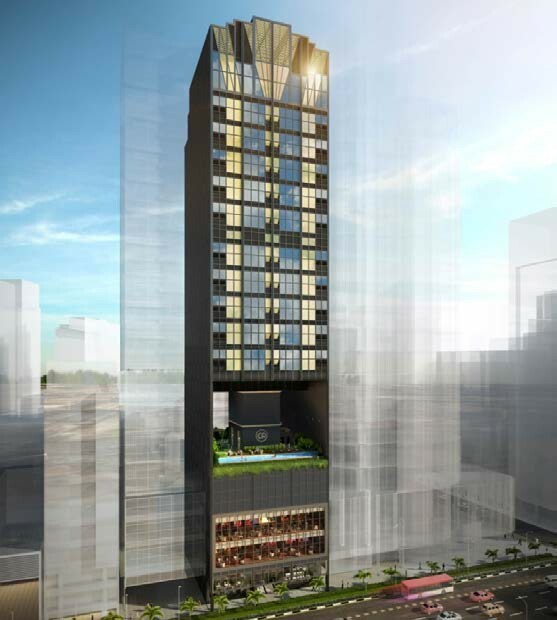 Developed by WyWy Development Pte Ltd on a land area of 9,084 sq ft and plot ratio of 11.2, a former site of Chow House, Crown at Robinson will be a impressive 19 storey work of art designed to capture the attention of the business arena, an iconic office tower with a unique mix of dining and lifestyle concepts. 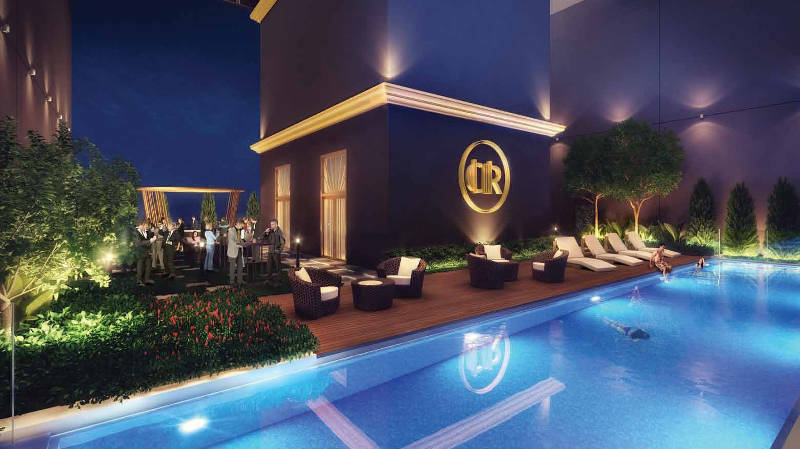 Architecturally styled in an Art Deco a dramatic golden tone set against classic dark hue, the 19 storeyed Crown at Robinson will house 86 offices, 6 retail shops complete with sky facilities terrace at level 6 and at the roof top. A magnificent jewel-like glass crown sits atop of the building evoking a sense of sophisticated elegance and timeless grandeur, striking from afar. A crowning achievement designed to make a statement. It is an instantly recognizable business address. Crown @ Robinson is easily accessible via a multiple modes of transportation. It is a rare freehold site nestled by 4 MRT stations within walking distance. The nearest is only a 3 min walk from Tanjong Pagar MRT station connecting to the Green Wast-West line and 8 to 10 mins walk from either Telok Ayer or Downtown MRT station connecting to the Blue Downtown line. By 2019 it will have the Shenton Way MRT station as the nearest station just 240 m away which will connect to the Thomson East Coast line. There is also a bus stop right at its doorstep and a taxi stand in front of it. By motor vehicle, Crown Robinson is easily accessible via four major expressways, Ayer Raja Expressway (AYE), Marina Coastal Expressway (MCE) leading straight into the arterial roads. 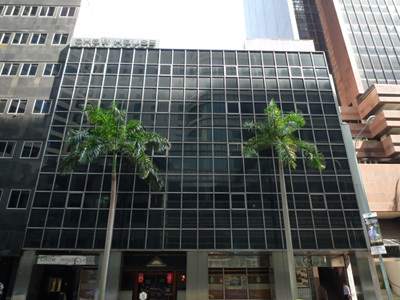 With resilient rentals and capital values, Grade A offices has proven to be a rock solid segment of Singapore commercial property market which has so far been unfazed by government's cooling measures. "As a result of this new wave of leasing activity spurred by improved business confidence, all Grade A office micro-markets have breached the technical full occupancy rate of 95% by the end of June 2014 - Collier International." According to studies by leading property analyst, these demands are also backed by our Republic's sound fundamental. For instance Singapore has retained it's titled as the world's most investor friendly destination for businesses by Business Environment Rankings from The Economist Intelligence Unit (EIU). In another study by Z/Yen Group’s Global Financial Centres Index, Singapore Financial Centre is ranked fourth in the world after New York, London and Hong Kong. As the republic gained global prominence, more global enterprises are attracted to setup or expand their operations on our shores. Bullish demands is expected to continue in the next 5 years while supply may not keep up as leading property analyst predicts. In fact Singapore is expected to top the rental forecast for Asia Pacific cities, with a 25 per cent increase in office rents from 2014-2019, according to a study by Knight Frank. While the office market segment offers robust investment opportunities, availability of strata-titled offices are rare as commercial buildings are predominantly owned by listed companies, REITs, government link companies and private funds coupled with the authorities calculated plan in approval of strata-subdivided commercial buildings. Here is a rare golden opportunity. So Don't Miss It. Register Your Interest Early. Offices is the only segment that shines, Untouched by cooling measures - No ABSD, No SSD! 4 train station within walking distance - Tanjong Pagar (closest within 3mins walk), Telok Ayer, Downtown and a future Shenton Way station. Singapore CBD transformation plan into Work Live and Play is only starting to take shape. Crown at Robinson is right where the action is. A striking tower with a crowning achievement designed to make a statement about the success of your business. Crown @ Robinson is designed with the Sophisticate Elegance and Timeless Grandeur hence a Highly Desirable Prestigious Address to Own It! 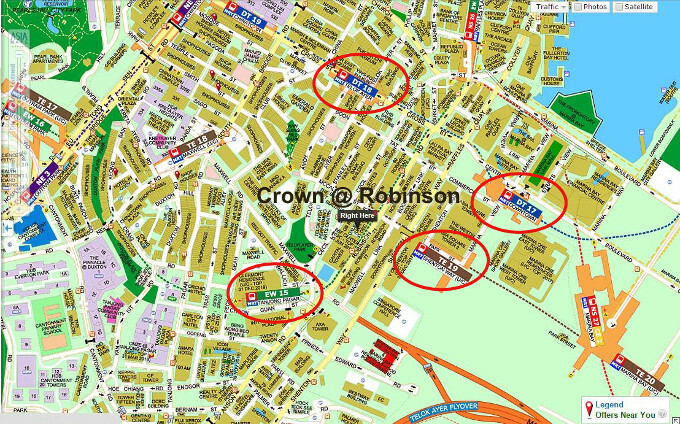 Crown Robinson at 140 Robinson Rd&nbs is just a short 3 mins walk from Tanjong Pagar MRT station. It is also served by 3 other stations all within walking distance - Telok Ayer, Downtown and future Shenton Way Station. Escape to world of relaxation at level 6 lush landscape garden or rejuvenate with a deep into the 20m infinity pool. Host company events, boardroom meeting or bonding session at the multi-purpose sky pavilions with the convenience of food easily catered from Crown's very own restaurant or cafe at ground level. Register for Your Interest Now! 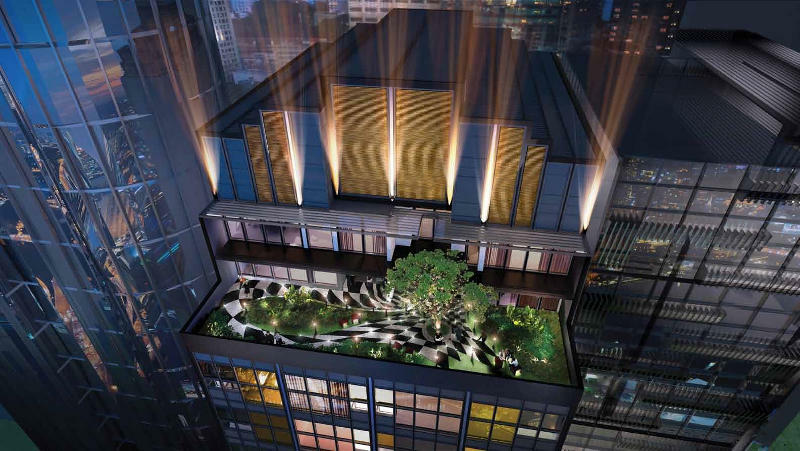 DON"T Miss this rare opportunity to own a freehold strata titled commercial property right in the heart of Singapore Central Business District. Simply express your interest by filling up the contact form below and you will be posted with the latest development on floor plans and indicative prices. Also be amongst the 1st to get the first bite of the cherry at early bird price when invitation of private preview is opened.